The Escherichia coli SMC complex, MukBEF, acts in chromosome segregation. MukBEF shares the distinctive architecture of other SMC complexes, with one prominent difference; unlike other kleisins, MukF forms dimers through its N-terminal domain. 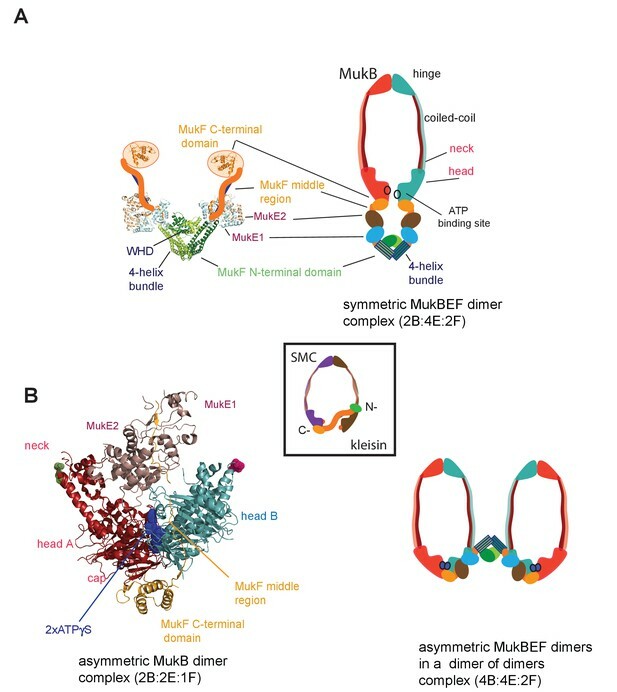 We show that a 4-helix bundle adjacent to the MukF dimerisation domain interacts functionally with the MukB coiled-coiled ‘neck’ adjacent to the ATPase head. We propose that this interaction leads to an asymmetric tripartite complex, as in other SMC complexes. Since MukF dimerisation is preserved during this interaction, MukF directs the formation of dimer of dimer MukBEF complexes, observed previously in vivo. The MukF N- and C-terminal domains stimulate MukB ATPase independently and additively. We demonstrate that impairment of the MukF interaction with MukB in vivo leads to ATP hydrolysis-dependent release of MukBEF complexes from chromosomes. Most DNA in a cell is arranged in structures called chromosomes. From bacteria to humans, chromosomes have to be compacted and highly organized to allow the cells to maintain and use their genetic information. In all organisms, large ring-shaped protein complexes play a crucial role in managing chromosomes. They transport and organize DNA thanks to reactions whose precise mechanism remains unknown. In bacteria, MukB and a type of kleisin called MukF are two examples of molecules involved in chromosome management. Two MukBs join at one end to form a hinge; at the other end, each MukB protein has a neck and a head. The two heads are linked by the kleisin to form a large protein ring, which can open to capture DNA. The MukB heads can trigger a biochemical reaction that creates the energy essential to trap and release DNA during DNA transport. Here, Zawadzka et al. study how the different components of the MukB-kleisin complex interact with each other to undergo the biochemical reactions that lead to DNA transport. The experiments show that the kleisin joins two MukB heads by attaching the base of one to the neck of the other, asymmetrically closing the ring. The separate interactions of different regions of the kleisin to the head and neck of MukB independently activate the two MukB heads, thereby controlling essential steps in the reactions with DNA. Two MukB-kleisin ring complexes are joined to each other because of a tight interaction between the two kleisin molecules. This leads Zawadzka et al. to suggest that DNA is sequentially grabbed and released from these two rings during DNA transport, similar to how a climbing rope is attached and released through carabiners. Cells cannot survive or be healthy without their chromosomes being accurately managed. It is still unclear how molecules such as MukBs and kleinsins drive this process. A better picture of their structure and interactions is an essential first step to understand these mechanisms. SMC (Structural Maintenance of Chromosomes) complexes have important roles in managing and processing chromosomes in all domains of life (Gligoris and Löwe, 2016; Nolivos and Sherratt, 2014; Uhlmann, 2016). The distinctive architecture of SMC proteins is conserved with the N-and C-terminal globular domains coming together to form an ATPase head and the intervening polypeptide folding upon itself to form ~50 nm long intramolecular coiled-coil arms, with a dimerisation hinge distal from the head (Figure 1A). Upon ATP binding, the heads of SMC dimers engage to generate two ATPase active sites (Haering et al., 2002; Lammens et al., 2004). In eukaryotes, SMC complexes are exclusively heterodimeric, whilst those in bacteria are homodimers. Nevertheless, the distinctive SMC architecture is conserved, with a kleisin protein linking the two ATPase heads of an SMC dimer, thereby forming a large tripartite proteinaceous ring (Figure 1 inset). Essential accessory ‘kite’ (kleisin interacting winged-helix tandem elements) or ‘hawk’ (HEAT repeat subunits containing proteins associated with kleisins) bind the kleisin (Palecek and Gruber, 2015; Wells et al., 2017). Hawk proteins are present in cohesins and condensins, while kites are present in bacterial SMC complexes, including MukBEF, and eukaryote SMC5/6 complexes. This suggests that the bacterial complexes are more evolutionarily related to the SMC5/6 complexes of eukaryotes than to eukaryote cohesins and condensins. A substantial body of work has led to the hypothesis that DNA segments are topologically entrapped within these tripartite rings. ATP binding and hydrolysis are required for the entrapping of DNA within the rings, loading, and for DNA release, unloading (Arumugam et al., 2003; Çamdere et al., 2015; Cuylen et al., 2011; Gruber et al., 2003; Haering et al., 2002; Haering et al., 2008; Hu et al., 2011; Kanno et al., 2015; ; Nasmyth, 2011; Murayama and Uhlmann, 2014; Uhlmann, 2016; Wilhelm et al., 2015). (A) Left panel; Schematic of a MukF dimer based on the structure of the MukF N-terminal region bound by MukE (pdb, 3EUH; Woo et al., 2009) and the C-terminal domain (pdb 3EUK, Woo et al., 2009), with a cartoon of the intervening middle region. Right panel; cartoon of a ‘classical’ view of the proposed symmetric complex of MukBEF in the absence of ATP, with a molecular ratio of 2B:4E:2F. Inset centre; schematic of a typical SMC-kleisin tripartite ring. (B) Left panel; crystal structure of H.ducreyi hMukE-hMukF(M + C)-hMukBhdEQ-ATP-γS asymmetric complex (pdb 3EUK, Woo et al., 2009). The asymmetric complex is formed by ATP-γS-mediated head engagement; the molecular ratio is 2B:2E:1F; the residues at the coiled-coil exit points are indicated on each head by green and pink dots, respectively. Right panel; cartoon of MukBEF dimer of dimers with stoichiometry of 4B:4E:2F, inferred from in vivo stoichiometry measurements (Badrinarayanan et al., 2012a). E. coli and its closest γ-proteobacterial relatives, encode an apparently distant SMC relative, MukBEF, with little primary sequence homology to other SMCs (Nolivos and Sherratt, 2014). Organisms encoding MukBEF have co-evolved a number of other distinctive proteins, some of which interact with MukB physically and/or functionally; specifically, topoisomerase IV and MatP both interact with MukB in vitro and in vivo (BrezellecBrézellec et al., 2006; Hayama and Marians, 2010; Hayama et al., 2013; Li et al., 2010; Nicolas et al., 2014; Nolivos et al., 2016; Vos et al., 2013). MukB forms SMC homodimers, whereas MukF is the kleisin and MukE the kite protein that binds MukF (Palecek and Gruber, 2015). All three proteins of the MukBEF complex are required for function, and their impairment leads to defects in chromosome segregation, manifested by impairment of segregation of newly replicated origins (ori) and mis-orientation of chromosomes with respect to their genetic map within cells (Danilova et al., 2007). In rich media, this leads to inviability at higher temperatures and formation of anucleate cells during permissive low-temperature growth (Niki et al., 1991; Yamanaka et al., 1996). Where characterised, most SMC complexes bind their cognate monomeric kleisins asymmetrically, with their N-terminal regions binding the SMC ‘neck’ adjacent to the ATPase head of the molecule distal to the molecule binding the kleisin C-terminus, thereby-forming the tripartite protein ring (Figure 1 inset) (Bürmann et al., 2013; Gligoris et al., 2014; Gligoris and Löwe, 2016; Gruber et al., 2003; Haering et al., 2004; Huis in’t Veld et al., 2014). MukF is an atypical kleisin, in that it forms stable dimers through interacting N-terminal winged-helix domains (WHD), while its C-terminal domain interacts with the MukB head at the cap, as is the case for characterised SMC kleisins (Fennell-Fezzie et al., 2005; Woo et al., 2009). Therefore, one MukB dimer is expected to bind a MukF dimer and two MukE dimers in the absence of ATP (Figure 1A); ATP binding leads to head dimerisation, accompanied by steric expulsion of one of the two MukF C-terminal domains and head engagement (Woo et al., 2009, Figure 1B left panel). Here, we reveal that MukF, like other characterised kleisins, interacts functionally with the MukB neck, through a 4-helix bundle in its N-terminal domain, while its C-terminal domain interacts with the MukB head at the cap. We show that this interaction with the MukB neck is required for MukBEF function in vivo, and infer that this interaction is established and broken during cycles of ATP binding and hydrolysis. Impairment of this interaction in vivo leads to ATP hydrolysis-dependent release of MukBEF clusters from chromosomes. Interactions of the MukF N-terminal domain with the MukB neck and MukF C-terminal domain with the MukB head, activate MukB ATPase independently and additively in vitro, with the addition of both fragments restoring wild type MukB ATPase levels. Each of these ATPase activities was inhibited by MukE, with the inhibition being relieved in the presence of DNA. We show that interaction of the MukF N-terminal domain with the MukB neck did not compromise MukF dimerisation. Therefore, MukF dimerisation in heads-engaged MukBEF complexes directs formation of dimers of MukBEF dimers, thereby explaining the stoichiometry observed in vivo (Badrinarayanan et al., 2012a, Figure 1B right panel). Because of the intriguing distinction between dimeric MukF and monomeric kleisins (Figure 1), we set out to test, if the MukF N-terminal domain would interact with the MukB neck, thereby exhibiting the architecture of other SMC dimers and their cognate kleisins. In order to undertake an initial characterisation of MukB-MukF interactions, C- and N-terminal MukF Flag-tagged truncations, immobilised on anti-Flag resin, were analysed for binding to intact MukB and its truncated derivatives containing just the ATPase head (MukBH), or the head plus approximately a third of the adjacent coiled-coil region (MukBHN). The latter variant would be expected to retain any ‘neck’ interaction determinants for MukF, based on similarity with kleisin interacting ‘necks’, adjacent to the SMC heads of other SMC complexes (Figure 2A; Bürmann et al., 2013; Gligoris et al., 2014). MukF C-terminal derivatives, FC1 and FC2, interacted with MukB, and all of its derivatives, as expected, because the MukB ATPase head participates in this interaction (Figure 2B; Figure 1; Woo et al., 2009). FN2, containing the N-terminal dimerisation WHD and an adjacent 4-helix bundle, interacted strongly with intact MukB and MukBHN, but not with MukBH, consistent with FN2 interacting with the MukB neck (Figure 2B). Since we reproducibly recovered low levels of MukBH in pulldowns with FN2, the MukB head might also bind FN2 weakly, although we could not substantiate this by further biochemical analyses (below). We detected no interactions of FN1, containing just the WHD involved in MukF dimerisation, with the MukB derivatives. In contrast, FN3, containing the 4-helix bundle (helices 6–9), and FN4, carrying only helices 8 and 9, interacted with MukB and MukBHN, but not MukBH (Figure 2B). 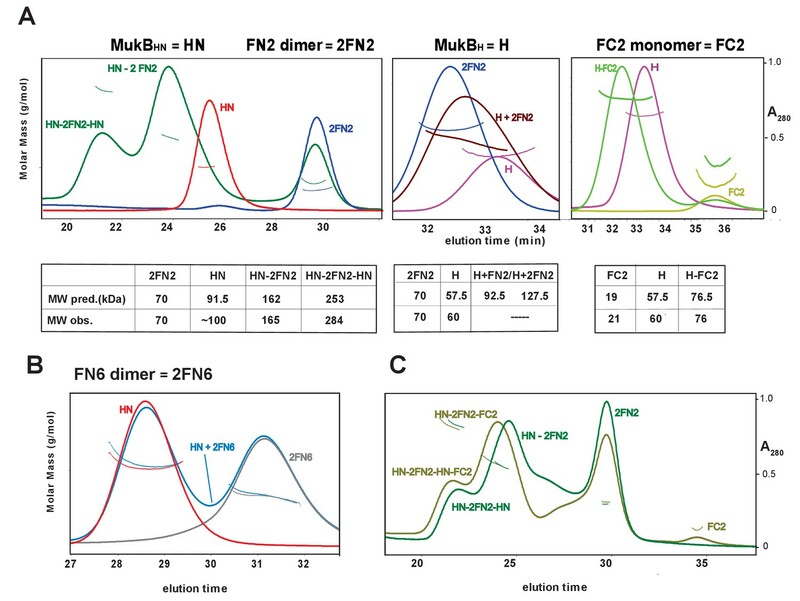 Consistent with this, FN6 lacking helices 8 and 9 failed to show an interaction in size exclusion chromatography-multi-angle light scattering (SEC-MALS) assays (below) and FN7, lacking helix 9 failed to interact with MukBHN (Figure 2B bottom right panel). We conclude that while helices 8 and 9 of the 4-helix bundle are sufficient for interaction with the MukB neck, helix 9 is essential. The MukF N-terminal domain interacts with MukB neck. (A) Left panel; schematics of MukF truncations. The MukF N-terminal WHD is responsible for MukF dimerisation, while the C-terminal WHD interacts with the MukB head (Fennell-Fezzie et al., 2005; Woo et al., 2009) The middle region contains binding sites for the MukE dimer (E1, E2,) and the C-terminal part of the extended polypeptide that interacts with the MukB engaged head (Hb; Woo et al., 2009). Right panel; the MukB head variant (MukBH) carries N- and C-terminal regions that together constitute head domain, joined by 18 aa residue flexible linker, while the MukB ‘head and neck’ variant (MukBHN) in addition carries the predicted, head proximal coiled-coil segment (CC) with 104/185 amino acid residues adjacent to the MukB N- and C-terminal domains, respectively (Li et al., 2009; Weitzel et al., 2011). Cartoons of MukF N- and C-terminal domain structures are included. (B) Pull-down assay using MukF-FLAG tagged fragments as baits for the indicated MukB derivatives. The amounts of recovered MukB, MukBHN or MukBH are shown within the top boxed portion of the gel in each panel, alongside the MukB derivative input and Ctl., a control with no added bait. Note, that the reduced pull-downs with FN3 and FN4 as compared to FN2, are likely a consequence of reduced concentrations of these baits in extracts. To confirm these observations, and to determine the molecular mass of the complexes, we used SEC-MALS (Figure 3). MukBHN was monomeric in solution, while FN2 was dimeric, as expected from structural analyses (Fennell-Fezzie et al., 2005; Woo et al., 2009). When mixed at a molar ratio of 1 MukBHN monomer:1.25 2FN2 (in the figures, we refer to FN2 dimers as 2FN2, to reflect their dimeric state), two additional peaks of masses 165 kDa and 284 kDa were evident in addition to the MukBHN monomers (Figure 3A left panel). We interpret these as complexes in which either one or two MukBHN molecules bound independently to a single FN2 dimer. Consistent with this interpretation, more of the larger complexes were observed at higher MukBHN to 2FN2 ratios (3:1; Figure 3—figure supplement 1). Therefore, the interaction between the MukF N-terminal domain and the MukB neck does not compromise MukF dimerisation. 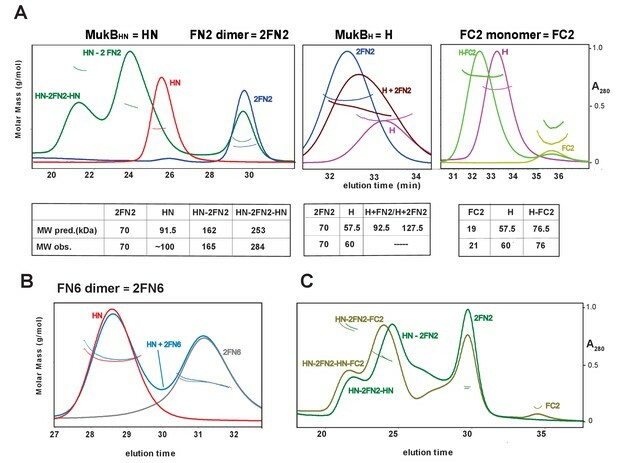 The relatively low proportion of complexes of stoichiometry MukBHN-2FN2-MukBHN as compared to MukBHN-2FN2 in the presence of a large excess of MukBHN, indicates that binding of the second MukBHN to MukBHN-2FN2 complex may be less favourable than binding of the first MukBHN to FN2. Complexes of MukF N- and C-terminal domains with MukB head variants. Binding and stoichiometry of complexes was determined by SEC-MALS. (A) Left panel; MukBHN (red), 2FN2 (blue), and MukBHN + 2FN2 (green) at a 1:1.25 monomer:dimer molar ratio. Middle panel; MukBH (pink), 2FN2 (blue), and MukBH + 2FN2 (brown) at 1:0.25 m:d ratio. Right panel; MukBH (pink), FC2 (lime green), and MukBH + FC2 (green) at a 1:1 m:m ratio. (B) MukBHN (red), 2FN6 (grey), and MukBHN + 2FN6 (blue) at a 1:0.25 m:d ratio. (C) MukBHN + 2FN2 at a1:1 m:d ratio (dark green), and MukBHN + 2FN2 + FC2 at a 1:1:1 m:d:m ratio (olive green). In agreement with the Flag-MukF-MukB interaction assays, FC2, but not FN2, formed complexes with MukBH (Figure 3A middle and right panels). FN6, which lacks the two C-terminal helices, 8 and 9, of the 4-helix bundle, failed to form complexes with MukBHN (Figure 3B). Addition of ATP did not significantly alter the nature or abundance of complexes containing MukBHN and FN2 or FC2 (Figure 3—figure supplement 2). This is consistent with MukBHN, which is a monomer in solution, being unable to form stable heads-engaged dimers with either FN2 or FC2 in the presence of ATP. We next tested whether monomers of MukBHN can simultaneously bind both FN2 and FC2. SEC analysis (Figure 3C) showed that mixtures of MukBHN, FN2 and FC2 yielded larger complexes (olive green trace) than those formed with MukBHN and FN2 alone (dark green trace), consistent with binding of both FN2 and FC2 to a single monomer of MukBHN. Nevertheless, it was not possible to assign precise masses to these by light scattering, because of the dynamic nature of the complexes and an inability to completely resolve them under a range of SEC conditions. 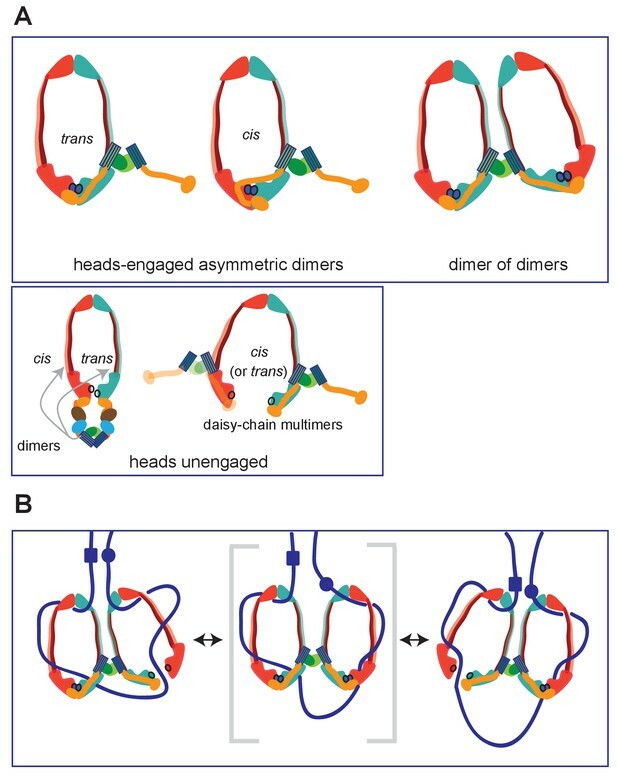 Therefore, a complex containing a MukB dimer with unengaged heads, bound to a MukF dimer may be stabilised by MukF interactions to both the MukB head and neck. An equivalent result was observed with B. subtilis SMC complexes, with both head and neck of a single SMC molecule being bound simultaneously by kleisin N-and C-terminal domains (Bürmann et al., 2013). MukB dimers alone had negligible ATPase activity (Figure 4), in agreement with previous reports (Petrushenko et.al., 2005; Woo et al., 2009). Addition of MukF kleisin led to robust MukB ATPase. The steady state ATPase rate was ~21 ATP molecules hydrolysed/min/MukB dimer, under conditions of MukF excess (Figure 4—figure supplement 1A). MukF alone did not exhibit ATPase activity. To dissect the MukF requirements for MukB ATPase, we assayed two MukF truncations, containing either the N-terminal domain (FN2), or the C-terminal domain and the middle region (FC2) (Figure 2A). Both variants stimulated MukB ATPase (Figure 4). 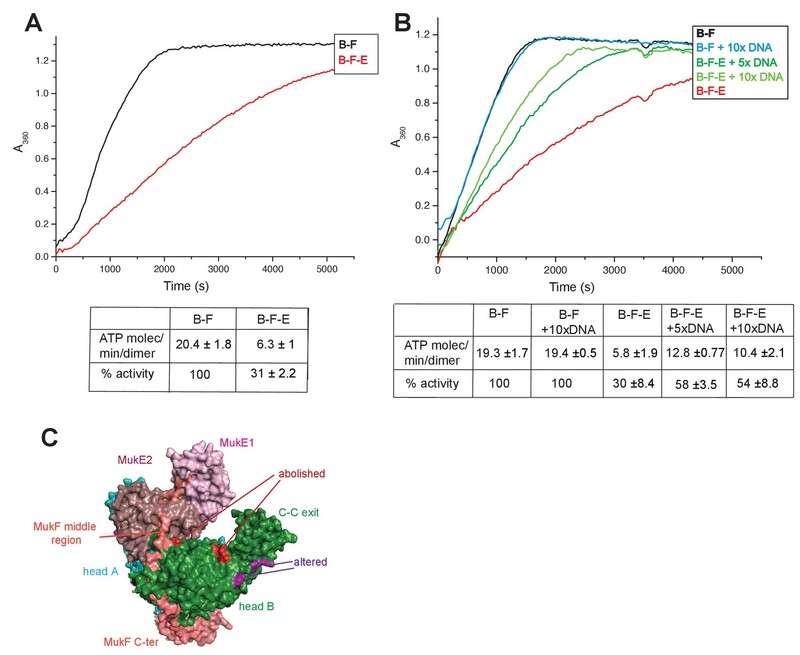 Saturating FC2, at a 2.5-fold molar excess, gave 60% of the maximal ATPase obtained with MukF, while saturating FN2 (at a 2.5-fold molar excess) gave 33% of maximum ATPase (Figure 4—figure supplement 1BC), while a truncation equivalent to FN2 plus the MukF middle region raised this level to ~50% (later). Addition of FN2 and FC2 together restored ATPase to the level observed with wild type MukF. FN6, lacking helices 8 and 9, did not stimulate MukB ATPase, consistent with its failure to interact with the MukB neck (Figure 4—figure supplement 1D). Taken together, the results show that MukB ATPase is activated additively and independently by the N-and C-terminal domains of MukF, with each domain being able to activate ~50% of maximal MukB ATPase. MukF N- and C-terminal domains stimulate MukB ATPase. 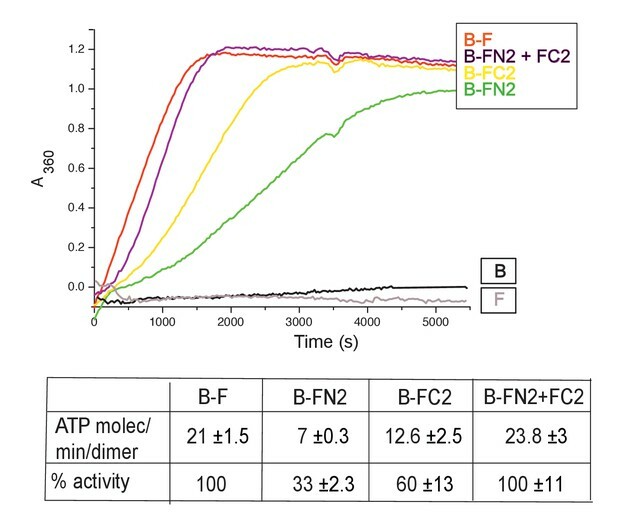 Concentrations in the assays were: MukB, 0.5 μM, MukF/FN2/FC2 1.25 μM, that is, at molar ratio of B:F, 0.5:1.25 monomer equivalent. The curves in the graph represent a single experiment; averages of initial rates ± SD from three experiments are tabulated beneath. To gain further insight into the interaction of the MukF 4-helix bundle and the MukB neck, variants altered in the MukB neck and MukF helix 9 were analysed for their activity and binding. The mutagenesis strategy was informed by structures of comparable kleisin and SMC neck interactions in yeast cohesin, and B. subtilis SMC complexes (Gligoris et al., 2014; Huis in’t Veld et al, 2014,Bürmann et al., 2013); see Materials and methods for the mutagenesis strategy). Three variants with triple substitutions in helix 9 of FN2 exhibited an impaired ability to activate MukB ATPase. FN2m2 (substitutions R279E K283A R286A) displayed a ~10 fold reduction in the ability to activate MukB ATPase, FN2m3 (D261K S265K Q268A), showed a ~2 fold reduction, while FN2m1 (D272K I275K R279D) was reduced by about a third (Figure 5A). Moreover, SEC analysis showed that FN2m1 and FN2m2 failed to interact detectably with MukBHN (Figure 5—figure supplement 1). Consistent with these results, functional in vivo complementation analysis of the ability of full length MukF variants, containing these sets of mutations, showed that neither MukFm2 nor MukFm3 could complement the temperature-sensitivity of ΔmukF cells, while MukFm1 exhibited partial complementation (Figure 5—figure supplement 2). Interface between the MukB neck and the MukF four-helix bundle. (A) Left panel; cartoon of MukF N-terminal domain fragment carrying the N-terminal dimerisation domain (green) and part of the middle region (orange). Helices 8 and 9 are indicated in cyan. The mutated amino acid residues in variants FN2m1, FN2m2 and FN2m3 are indicated in yellow, red and purple, respectively, (residue R279 was altered in both m1 and m2, but is shown only in m2); views of helices 8 and 9 from different angles are shown separately. Right panel; ATPase activities of the mutated variants; means of initial rate measurements from three experiments are tabulated below. (B) Left panel; ATPase activities in the presence of MukF, of MukB and MukB variants mutated at the neck, MukBm1, blue, and MukBm3, yellow. Averages of initial rates from three experiments are tabulated underneath. Right panel; monomer of the MukB head (pdb 3EUK, Woo et al., 2009); the helix that emerges from the C-terminal subdomain of the head (C-ter helix) and forms the head-adjacent segment of the coiled-coil has been extended by modelling (shown in lilac). Right; enlarged view of the C-ter neck helix from the top with mutated residues shown. (C) Interactions of kleisin N-terminal domains with SMC necks. Left panel; Smc3-Scc1N; Gligoris et al. (2014). Right panel; B. subtilis SMC-ScpAN; Bürmann et al. (2013). The coiled-coil neck consists of two helical regions protruding from the SMC N-terminal head subdomain (N-ter helix; yellow), and from the C-terminal head subdomain (C-ter helix; red). Kleisin helices are shown in cyan. In addition, we analysed MukB variants carrying three double amino acid substitutions in the neck, located near MukB C-terminal head domain. They were designed to be at different locations on the putative candidate coiled-coil helix, that protrudes from the C-terminal subdomain of the MukB head, in positions that were predicted to point towards the MukF 4-helix bundle (Figure 5B). MukBm3 (L1219K L1226K) had about 35% of wild type ATPase activity when activated by full length MukF; FN2 was unable to activate its ATPase, while FC2 activated it as efficiently as wild type MukF, consistent with its defect in interaction with FN2 (Figure 5—figure supplement 3; Figure 5—figure supplement 4). MukBm2 (E1216A E1230A), showed no reduction in ATPase, while MukBm1 (M1215K L1222K) had <10% of MukF-stimulated MukB ATPase (Figure 5B), indicating that both the MukF N- and C-terminal fragments failed to activate the MukB ATPase of this variant (Figure 5—figure supplement 3). Although we believe that this protein can fold correctly, the failure to have its ATPase activated by the MukF C-terminal domain is not yet understood; perhaps substitutions at these residues result in an alteration of the coiled-coil structure adjacent to the head, thereby compromising head engagement. MukBm1 and MukBm3 failed to bind FN2 in FPA assays (Figure 5—figure supplement 4). Consistent with these results, expression in vivo of MukBm1 failed to complement the temperature-sensitive growth defect of ∆mukB cells, while MukBm3 exhibited partial complementation. MukBm2 expression fully complemented the Muk- phenotype (Figure 5—figure supplement 5). These data suggest that the MukBm3 altered residues (L1219K and L1226K) could either be directly involved in the interaction with MukF 4-helix bundle, or that their replacement by charged lysine residues, interferes with a normal interaction interface. Using the E. coli MukEF crystal structure (pdb, 3EUH; Woo et al., 2009), along with the structure of the engaged MukB heads, we modelled a FN2 dimer bound by two monomers of MukBHN. This indicated that unless a major conformational change within FN2 dimer takes place upon MukBHN binding, the arrangement of the heads, imposed by interaction of their necks with the 4-helix bundles of the dimer, would be very different from the one revealed by the structure of the engaged MukB heads complex (Figure 5—figure supplement 6A). The motifs that compose the two ATPase active sites in each head monomer would be distant and rotated away from each other. Therefore, if simultaneous binding of the two necks within the intact MukB dimer by the two N-terminal domains of MukF dimer is possible, it would produce a complex whose heads would not be able to engage in ATP binding. Whether such a complex is generated at any stage of the MukBEF activity cycle remains to be determined. In conclusion, the functional interaction between the MukF N-terminal helix 9 and the neck region of MukB coiled-coil revealed and characterised here is equivalent to the similar interaction in other characterised SMC complexes (Gligoris et al. (2014); Huis in’t Veld et al, 2014,Bürmann et al., 2013). MukE inhibited MukF-stimulated MukB ATPase in steady-state assays (Figure 6A; Bahng et al., 2016). This inhibition was MukE concentration-dependent (Figure 6—figure supplement 1). We then tested whether MukE could equally inhibit the ATPase activated by the isolated C- and N-terminal domains of MukF. The incorporation of MukE into a MukBF complex depends on the asymmetric binding of a MukE dimer to the MukF middle region, which also interacts with MukB head in the engaged MukB heads complex (Shin et al., 2009; Woo et al., 2009; Figure 7A and Figure 1B left panel). In the absence of MukE, the N- and C-terminal variants of MukF carrying the entire middle region, FN10 and FC2, respectively, showed 50–60% of wild type MukF activation activity, whereas variants lacking the middle region, FN2 and FC5, showed 25–33% of activation activity, thereby implicating the middle region, whether it be specified by the C- or N-terminal domains, in stabilising or directing, a conformation that optimises ATP hydrolysis. Both the MukF C-terminal head binding fragment (Figure 7A, ‘Hb’) and the MukE binding segment of the MukF middle region (Figure 7A, ‘E1a, E1b, E2’) contributed to the optimal activation activity (Figure 7B). The molecular basis underlying the role of this middle region segment in maximising steady state MukB ATPase remains unclear; there are no structural data available to inform how the MukF middle region interacts with the MukB head in the absence of MukE. (A) MukE inhibits MukBF ATPase. Concentrations: MukB, 0.5 μM, MukF 1.25 μM, and MukE 5.0 μM. (B) DNA alleviates MukE-mediated inhibition. ATPase was measured in the presence/absence of 53 bp linear ds DNA fragment at 5x or 10x molar excess over MukB. The average values of the initial rates ± SD from three experiments are tabulated beneath the graphs. (C) Surface representation of the MukBEF asymmetric complex with amino acids, whose substitution abolished (red) or altered interactions with DNA (Woo et al., 2009). Influence of the MukF middle region on the modulation of MukB ATPase by MukE and DNA. (A) One monomer of a MukE dimer binds helical region E1a and part of the acidic linker E1b, while the second MukE monomer binds E2. Hence, MukE binds FC2, containing the entire middle region, but not FN2, which lacks the middle region (Figure 7—figure supplement 1). The C-terminal part of the MukF middle region forms an extended polypeptide that binds the MukB head in the asymmetric complex (Hb; Woo et al., 2009). (B) Stimulation of MukB ATPase by MukF variants in the presence and absence of MukE and DNA (53nt ds fragment at 10-fold molar excess over MukB). The bars show means of the initial rates ± SD from three independent experiments. 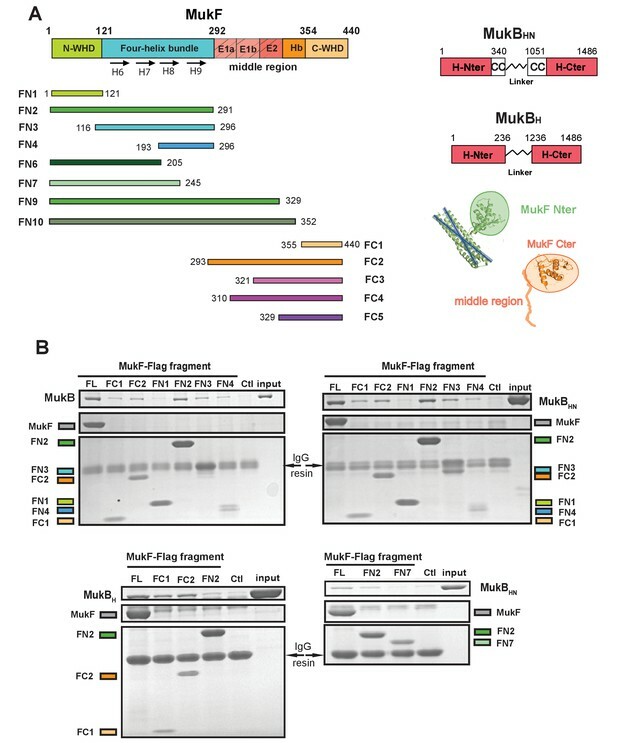 MukE inhibited MukB ATPase activated by the MukF N- and C-terminal domain variants that carried complete MukE dimer binding sites (FN9, FN10 and FC2), with a ~4 fold greater inhibition of activation by FN10, as compared to FC2 (Figure 7B). MukE was unable to inhibit ATPase stimulated by FN2 and FC5, both of which were lacking MukE binding sites. The effect of MukE on FC4, lacking the N-terminal part of the MukE1 binding site (E1A) was to partially inhibit ATPase activation. 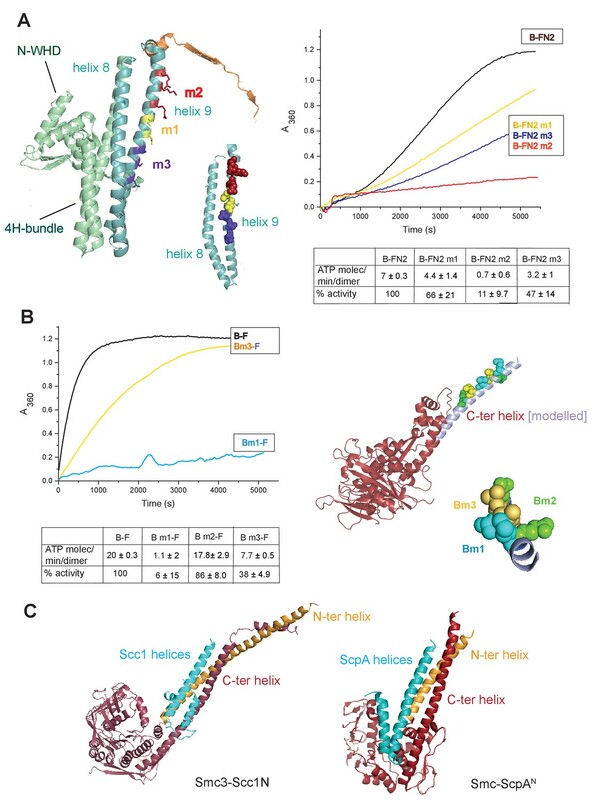 These data demonstrate that each of the MukB ATPase activities, stimulated independently by the N- and C-terminal domains of MukF can be inhibited by MukE binding to MukBF. Previous reports have shown no effect of DNA on the ATPase of MukBEF (Chen et al., 2008, Petrushenko et al., 2006; Woo et al., 2009), whereas B. subtilis SMC ATPase was reported to be stimulated modestly by DNA (Hirano and Hirano, 2004). We confirmed that MukB ATPase is independent of the presence of DNA (Figure 6B); addition of 53 bp ds linear DNA at 20-fold excess (10 μM) over MukB (0.5 μM), did not influence MukBF ATPase activity. MukBF ATPase was not dependent on residual DNA contamination of the proteins as judged by the observation that extensive DNase treatment of MukBF did not influence the ATPase level. DNA alleviated the MukE-mediated inhibition of MukB ATPase. At 5–10-fold excess of DNA over MukB, the ATPase level was restored to ~50% of the level in the absence of MukE (Figure 6B). A similar restoration of activity was observed for most other MukF variants, although FC4 exhibited similar MukE-inhibited ATPase activities in the presence and absence of DNA (Figure 7B). MukF derivatives, FN2 and FC5, lacking MukE binding sites were not inhibited by MukE and did not respond to DNA. The position of the DNA binding interface on MukB heads, defined by structure-informed mutational analysis (Figure 7C; Woo et al., 2009), indicated that DNA binding to this interface could clash with MukE dimer binding to the MukF middle region in a heads-engaged MukBEF complex. Therefore, it seems possible that relief of MukE inhibition by DNA might reflect a competition between MukE and DNA for binding to the MukBF head complex, consistent with the demonstration that MukFE can disrupt MukB-DNA interactions (Petrushenko et al., 2006b). Since N-terminal and C-terminal domains of MukF could independently and additively bind MukB at the neck and cap, and independently stimulate MukB ATPase activity, we analysed the consequences of disruption of the interactions of endogenous MukF with MukB neck and cap regions in live cells. To this end, we over-expressed either FN2 or FC5 polypeptides from the inducible arabinose promoter on a multicopy plasmid in cells expressing chromosomal MukBmYPetEF. We assessed MukBEF function by analysing the presence and behaviour MukBmYPetEF clusters observed as fluorescent foci associated with the replication origin (ori) (Badrinarayanan et al., 2012a, 2012b; Nolivos et al., 2016). Induced over-expression of FN2 led to a rapid loss of MukBEF foci (half-life of loss ~10 min), whereas FC5 over-expression had a lesser effect on focus loss (half-life of loss ~45 min) (Figure 8, Figure 8—figure supplement 1). In both cases, residual MukBEF clusters remained ori-associated. We then tested if normal cycles of ATP binding and hydrolysis are responsible for the inferred turnover of MukF within functional MukBEF complexes, by testing the effect of fragment production on MukBEQEF complexes that are impaired in ATP hydrolysis and form clusters that turn over very slowly at the replication terminus (ter) rather than at ori (Badrinarayanan et al., 2012a). Over-expression of either FN2 or FC5 had little effect on ter-associated fluorescent MukBEQmYPetEF clusters, consistent with the observation in FRAP experiments that there was little turnover of these complexes, presumably as a consequence of their impaired ATP hydrolysis (Badrinarayanan et al., 2012a). Nevertheless, we cannot exclude the possibility that the failure to lose MukBEQEF complexes on FN2 or FC5 over-expression is a consequence of the altered cellular localisation of MukBEQEF complexes rather than their impaired ATP hydrolysis. Analysis of the protein composition in MukB+ and MukBEQ extracts, verified comparable high levels of induced expression of FN2 and FC5 in mukB and mukBEQ cells (>100 fold excess over endogenous MukF for both FN2 and FC5, when judged by Western blots; Figure 8—figure supplement 2). These observations are consistent with the hypothesis that the MukF interaction with MukB breaks and reforms during cycles of ATP binding and hydrolysis, and that impairment of this interaction leads to loss of functional MukBEF clusters from the chromosome. We have also considered the possibility that the loss of MukBEF clusters from ori after over-expression of FN2 results from the disruption of MukF dimers, rather than an opening of a ring interface. If this were the case, we would have expected the same result in mukBEQ cells. Overexpression of MukF N-terminal and C-terminal domains fragments leads to an ATP hydrolysis cycle-dependent release of MukBEF complexes from DNA in vivo. MukF FN2 and FC5 fragments were overexpressed from para promoter in pBAD24 by addition of arabinose. MukBmYPetEF and MukBEQmYPetEF complexes were visualised in the absence of arabinose and at every 20 min after induction. More than 500 cells were analysed for each condition. Experiment was repeated three times; error bars show standard deviation of 3 repeats. Bottom panel; images of FN2 overexpressing cells taken at time 0 and 60 min in MukBmYPetEF and MukBEQYPetEF strains (SN182 and SN311, Nolivos et al., 2016). The relatively low turnover of this interaction as compared to the dwell time of MukBEF complexes in vivo (~50 s) and the rates of ATPase measured in vitro could be a consequence of the chelate effect arising from the fact that when the N- or C-terminal domain is released from the MukB neck, or cap, respectively, the reminder of MukF remains associated with MukB through its other interactions, thereby giving a high re-binding rate. FN2 over-expression led to a ~4 fold more efficient displacement of labelled MukBEF complexes from DNA, than over-expression of FC5. These observations of ATP hydrolysis-dependent release are consistent with the interface between the MukF N-terminal domain and the neck disengaging more frequently than the interface between MukF C-terminal domain and the cap during the activity cycles of MukBEF. Alternatively, disruption of the MukF-neck interaction could lead to more imminent release of DNA from the complex. We note that at least one MukF C-terminal domain-MukB cap interface in a dimeric MukBEF complex has to be broken in each activity cycle to allow the formation of an asymmetric heads-engaged dimeric complex in which only one MukB monomer can bind a MukF C-terminus because of steric occlusion (Shin et al., 2009; Woo et al., 2009). Rebinding of a second MukF C-terminal domain to a MukB cap that becomes available after ATP hydrolysis might be necessary to initiate the next cycle of MukBEF activity. Interfaces between the kleisin N-terminus and the SMC neck in yeast, drosophila and human cohesin complexes have been proposed previously to function as DNA exit gates dependent on SMC ATP hydrolysis (Beckouët et al., 2016; Buheitel and Stemmann, 2013; Chan et al., 2012; Eichinger et al., 2013; Huis in‘t Veld et al., 2014). The work here has revealed two important and related new insights into the action of the E. coli SMC complex, MukBEF. First, the demonstration that the MukF N-terminal domain interacts functionally with the MukB neck, with impairment of this interaction leading to MukBEF complex release from chromosomes and a Muk- phenotype. Second, the observation that the MukF C- and N-terminal domains activate MukB ATPase independently and additively, with each domain contributing ~50% of the maximal activity in steady state assays. We propose that both of these properties relate to the formation of an asymmetric complex between a MukB dimer and MukEF after ATP binding and consequent MukB head engagement. A crystal structure of a complex between a heads-engaged Haemophilus ducreyi MukB dimer bound by MukFE revealed this asymmetry (Figure 1B; pdb 3EUK; Woo et al., 2009; Figure 9A). In the asymmetric structure, only one MukB head was bound by a MukF C-terminal domain, with the adjacent MukF middle region binding to the second MukB monomer of the MukB dimer, thereby sterically occluding the binding of a second MukF C-terminal domain. This asymmetry induced by MukB head engagement was also observed in solution (Woo et al., 2009). Because the MukF N-terminal domain was absent in the variant used, the interaction uncovered here between the MukF N-terminal domain and the MukB neck was not evident. This view of an asymmetric MukBEF complex when heads are engaged is supported by biochemical and in vivo studies (Shin et al., 2009; Badrinarayanan et al., 2012a). Furthermore, such an asymmetry directed by interaction of the C- and N-terminal domains of kleisin with the head and neck of SMC dimers appears to be functionally conserved, regardless of whether they form SMC homodimers or heterodimers (Bürmann et al., 2013; Gligoris, 2014; Huis in‘t Veld et al. 2014). Summary of MukBF interactions and a model for DNA transport. (A) Top panel; Schematics of possible configurations of MukB and MukF interactions in ATP-bound head-engaged asymmetric complexes of MukBEF. We favour the trans-configuration, identical to those of other SMC complexes. Bottom panel; possible unengaged head complexes. The cartoon on the left is a repeat of that in Figure 1, but additionally indicating that the MukF 4-helix bundles may interact with the same MukB molecule as its C-terminal domain (cis), or the partner MukB molecule (trans). On the right, is a cartoon indicating how daisy-chained multimers could form; these have not been detected in the studies here. (B) Rock- (or rope-) climber model for DNA transport and loop extrusion by MukBEF, modified from (Badrinarayanan et al., 2012a). For clarity only MukBF is shown. The paths of DNA (blue lines; not to scale) are hypothetical, although DNA interactions with the MukB head and hinge have been demonstrated (Kumar et al., 2017; Woo et al., 2009). The state shown in the middle panel (parentheses) could rarely exist if ATP binding and hydrolysis were to be coordinated between the two MukBEF dimers. For presentational simplicity, we have shown MukBEF ring opening through head disengagement, by release and transfer of the MukF C-terminal domain to the ‘cis-configuration’, although results here and elsewhere provide stronger support for ring opening through release of the MukF N-terminal domain from the MukB neck. In reality, the patterns of DNA binding and release, and the conformational changes in the complexes are likely to be more complicated, with both an upper and a lower chamber in each dimeric complex (for example, see Diebold-Durand et al., 2017; Uhlmann, 2016). However, unlike other kleisins, which are apparently monomeric, MukF is a stable dimer and its dimerisation domain is adjacent to the 4-helix bundle, to which helices 8 and 9 belong. Nevertheless, binding of these helices to the MukB neck did not interfere with MukF dimerisation, a result consistent with our previous analysis inferring the existence of MukBEF dimers of dimers in vivo (Badrinarayanan et al., 2012a; Figure 9A; top panel; right). Note that an asymmetric heads-engaged MukBEF dimer can potentially form a symmetric dimer of dimers as a consequence of MukF dimerisation. We propose that in an engaged-heads dimeric MukBEF complex that the MukF C- and N-terminal domains contained within a single MukF molecule bind separate MukB monomers in the dimer (Figure 9A; top panel-trans), as demonstrated for other SMC complexes. Nevertheless, we cannot exclude the possibility that the asymmetric complex has the MukF C- and N-terminal domains bound to only one of the two MukB molecules, since we have shown that a single monomer of MukBHN can interact with separated MukF N- and C-terminal domains. If this were the case, an additional asymmetric interaction of the MukF middle region with the MukB monomer that is not bound by the MukF C- and N-terminal domains would be present (Figure 9A; top panel; cis). Examination of the heads-engaged asymmetric MukBEF crystal structure, in which the MukF N-terminal is absent, does not allow us to distinguish between these possibilities. Interaction between the MukF N- terminal domain and MukB neck is not only essential for MukBEF function in vivo, but also appears to be broken and reformed during cycles of ATP binding and hydrolysis. Additionally, interaction between the MukF C-terminal domain and the MukB cap may also break and reform during ATP binding and hydrolysis cycles. The observation that impairment of the normal MukF-MukB interactions leads to ATP hydrolysis-dependent loss of MukBEF clusters from chromosomes indicates that by opening of at least one MukB-MukF interface, DNA can be released from the ‘bottom ring chamber’ formed by a kleisin bridging a MukB head and the MukB neck of a partner molecule. This result provides further support for a mechanism in which ATP hydrolysis is required to release MukBEF and other SMC complexes from chromosomes (Murayama and Uhlmann, 2015; Nolivos et al., 2016). Equivalent interfaces between the kleisin and SMC3 neck in the yeast, drosophila and human cohesin complexes have also been proposed to act as DNA exit gates and it has been proposed that this interaction, which is not required for loading onto chromosomes, turns-over in response to ATP binding and hydrolysis (Beckouët et al., 2016; Buheitel and Stemmann, 2013; Chan et al., 2012; Eichinger et al., 2013; Elbatsh et al., 2017). Although, a DNA exit gate formed by the SMC coiled-coil neck-kleisin interaction appears to be conserved, we think it possible that other interfaces could additionally be used for DNA release. For example, the hinge dimerisation interface, which has been proposed to be a DNA entrance gate (Buheitel and Stemmann, 2013; Gruber et al., 2006), might additionally function as an exit gate under some conditions (Murayama and Uhlmann, 2013; Uhlmann, 2016). Because there are two potential proteinaceous chambers in SMC complexes, the upper one formed by a heads-engaged SMC complex and the lower one by the kleisin bound to the SMC (Diebold-Durand et al., 2017; Uhlmann, 2016), each of these chambers could have exit (and entrance) gates for DNA segments entrapped within each of them. In MukBEF, interaction of MatP-matS with the MukB hinge has been proposed to promote ATP hydrolysis-dependent release of MukBEF clusters from the ter region of the chromosome, suggestive of release through the dimerisation hinge (Nolivos et al., 2016). Similarly, MukB-dependent stimulation of catalysis by TopoIV could arise as a consequence of DNA exiting the MukB hinge and being presented to the TopoIV entrance gate, which is in proximity to the MukB hinge (Vos et al., 2013; Zawadzki et al., 2015). We propose that the observed independent and additive regulation of MukB ATPase by the MukF C- and N-terminal domains, may reflect asymmetry in the two ATPases resulting from asymmetric heads-engaged MukBEF dimer complexes. One of these could be activated by the MukF N-terminal domain and the other by the C-terminal domain. Nevertheless, examination of the heads-engaged MukBEF crystal structure did not reveal any differences in the two ATPase active sites. How the C- and N-terminal MukF domains activate MukB ATPase remain unclear; but their independent and additive action through interaction with different MukB targets, most likely on separate MukB molecules, is in our opinion, most consistent with them activating separate ATPase sites in a MukB dimer. Whether these activations occur at the stage of ATP binding, head engagement, the actual catalytic step, or several of these, remains to be determined. Asymmetric ATPase mechanisms have been demonstrated for ABC transporters, which share the overall organisation of their ATPase heads with SMCs (ter Beek et al., 2014; Procko et al., 2009; Zhou et al., 2016). Similarly, eukaryotic heterodimeric SMC complexes have active site region differences; for example, comparison of SMC1 sequences with those of SMC3 show protein family-specific differences, with their ATPases being differentially regulated, and in at least some cases, with independent functions (Beckouët et al., 2016; Çamdere et al., 2015; Elbatsh et al., 2017, 2016). We have inferred previously from in vivo experiments that ATP hydrolysis by MukBEF is required for both loading and unloading onto DNA (Nolivos et al., 2016). Therefore, one plausible explanation of our data is that the MukB neck-kleisin interaction acts in DNA unloading, leaving the MukB head-kleisin interaction to function in loading onto chromosomes. Similarly, a functional asymmetry in yeast cohesion ATPase active sites has been proposed, with the one equivalent to the kleisin-neck interaction uncovered here being required for release from chromosomes, while both ATPases were implicated in loading onto chromosomes (Çamdere et al., 2015; Elbatsh et al., 2017). Our own data do not address whether the interaction with the MukB neck is also required for loading. The significance of how and why MukE inhibits the MukB ATPase activated by either the MukF C-terminal, or the N-terminal domains, remains unclear. It could arise simply from the fact that MukE binding stabilises a particular MukBF conformation, thereby leading to less turnover during the steady state multiple turnover ATPase assays. Alternatively, or additionally, this could reflect MukE playing a regulatory role during transitions between various stages of MukBEF activity cycle. Other in vitro and in vivo studies have postulated a regulatory role of MukE (Gloyd et al., 2011; She et al., 2013), although details of how this regulation is mediated have been unclear. Nevertheless, depletion of MukE in vivo mimics the ATP hydrolysis-impaired phenotype of a MukBEQ mutant, which loads slowly onto DNA in the ter region, but is unable to undergo the multiple cycles of ATP binding and hydrolysis required to target to ori (Badrinarayanan et al., 2012b; Nolivos et al., 2016). The ability of DNA to relieve MukE inhibition of MukB ATPase could result from MukE and DNA competing for binding to the MukB head. This is consistent with in vitro studies, which showed competition between MukEF and DNA for MukB binding and that MukEF inhibited MukB-mediated DNA condensation (Cui et al., 2008; Petrushenko et al., 2006b). Furthermore, a patch of positively charged amino acid residues on the surface of MukB head, close to the base of the neck, was shown to be important for interaction with DNA (Figure 7C; Woo et al., 2009). Projection of B-form DNA onto this patch highlights the potential competition of DNA- and MukE-binding to a MukBF complex, which may reflect alternative states during the MukBEF-DNA activity cycle. A range of structures, alongside extensive biochemical and functional analyses, leads to the conclusion that all SMC complexes, including MukBEF, share distinctive architectures and similarities in their likely molecular basic mechanisms of action on chromosomes. Central to the SMC complex mechanism is the ability to bind and hydrolyse ATP in a modulated fashion, which directs stable loading onto chromosomes, regulated release from chromosomes and autonomous rapid transport with respect to DNA, which is likely to depend on such loading and release (Diebold-Durand et al., 2017; Terkawa et al., 2017; Wang et al., 2017). Any such transport must require at least two specific DNA-SMC complex attachment points on different conformational states of the complex, with coordinated transitions as transport proceeds. Our finding that MukF dimerisation is maintained during its interaction with the MukB neck, not only validates our demonstration of dimers of MukBEF dimers in active MukBEF clusters in vivo, but provides support for our previously proposed ‘rock (or rope) climber’ model for the transport of MukBEF dimer of dimers with respect to DNA (Figure 9B; Badrinarayanan et al., 2012a). This model assumes that dimers of MukBEF dimers are a minimal functional unit, in which coordinated capture and processing of DNA segments by each MukBEF dimer, similar to the action of a climber reaching out to ‘grab’ a rock/rope alternatively with each arm. The staggered cycles of ATP binding and hydrolysis, DNA trapping and release and associated conformational changes could effectively coordinate the activity within the partner dimers within MukBEF dimers. For SMC complexes that do not obviously form dimers of dimers, the type of loop-capture and fusion model proposed by Diebold-Durand et al., 2017 has merits. In this, DNA loops captured in the upper SMC chamber are transferred to the lower chamber, where they fuse with a pre-existing loop, thereby meeting the basic requirements for ATP hydrolysis-driven transport. MukB, MukBH, MukBHN, MukE, were 6xHis-tagged at the C-terminus (pET21), while MukF and its C- and N-terminal truncations were 6xHis-tagged at the N-terminus (pET28). MukB variants were expressed in strain FL01, which is mukB 3xFLAG C3013I (NEB). MukF variants and MukE 6xHis-tagged at the C-terminus were expressed from pET21 in C3013I cells (NEB). 2L cultures were grown in LB with appropriate antibiotics at 37°C to A600 ~0.6 and induced by adding IPTG at final concentration of 0.4 mM. After 2 hr at 30°C, cells were harvested by centrifugation, re-suspended in 30 ml lysis buffer (50 mM HEPES pH 7.5, 300 mM NaCl, 5%glycerol, 10 mM imidazole) supplemented with 1 tablet of protease inhibitor (PI), and homogenised. Cell debris was removed by centrifugation and clear cell lysates were mixed with 5 ml equilibrated TALON Superflow resin, poured into a column, then washed with 10 X volume of washing buffer (50 mM HEPES pH 7.5, 300 mM NaCl, 5% glycerol, 25 mM imidazole, PI). Bound proteins were eluted in elution buffer (50 mM HEPES pH 7.5, 300 mM NaCl, 5% glycerol, 250 mM imidazole). The fractions from TALON were diluted to 100 mM NaCl buffer and injected to HiTrapTM Heparin HP column (GE Healthcare) pre-equilibrated with Buffer A (50 mM HEPES pH 7.5, 100 mM NaCl, 10% glycerol, 1 mM EDTA, 1 mM DTT), then the column was washed at 1 ml/min flow rate until constant A280. Purified fractions were eluted with a gradient 100–1000 mM NaCl. For MukE and MukF purifications, fractions from Talon were diluted and injected onto a HiTrap DEAE FF column (GE healthcare) pre-equilibrated in Buffer A. Purified fractions were eluted with a gradient 100–1000 mM NaCl. Protein concentration was estimated by UV absorption at 280 nm on Nanodrop spectrophotometer, and protein purity and identity confirmed by electrospray ionisation mass-spectrometry and SDS PAGE. Proteins were aliquoted and stored at −20°C in a buffer containing 10% glycerol. ATP hydrolysis was analysed in steady state reactions using an ENZCheck Phosphate Assay Kit (Life Technologies). 150 µL samples containing standard reaction buffer supplemented with 2 mM of ATP were assayed in a BMG Labtech PherAstar FS plate reader at 25°C. The data were analysed using MARS data analysis software. Quantitation of phosphate release was determined using the extinction coefficient of 11,200 M−1cm−1 for the phosphate-dependent reaction at A360 nm at pH 7.0. Purified proteins were fractionated on a Superose 6 10/300 GL or a Superose 12 10/300 column equilibrated with 50 mM HEPES, pH 7.5 buffer containing 100 mM NaCl, 1 mMDTT, 1 mM EDTA, at flow rate of 0.5 ml/min. 500 µl samples containing analysed proteins were injected on the column and run at a flow rate of 0.5 ml/min. SEC-MALS analysis was performed at 20°C using a Shimadzu (Kyoto, Japan) chromatography system, connected in-line to a Heleos8+ multi angle light scattering detector and an Optilab T-rEX refractive index (RI) detector (Wyatt Technologies, Goleta, CA). Protein samples in 50 mM HEPES pH 7.5, 100 mM NaCl, 1 mM DTT, 1 mM EDTA, 10% glycerol, were injected in this system, and the resulting MALS, RI and UV traces processed in ASTRA 6 (Wyatt Technologies). MukF FLAG-tagged fragments were expressed from pET DUET plasmids in C3013I cells (NEB).1L cultures were grown in LB with carbenicilin (100 µg/ml) at 37°C to A600 ~0.6 and induced by adding IPTG to a final concentration 0.4 mM. After 2 hr at 30°C, cells were harvested by centrifugation, re-suspended in 30 ml lysis buffer (50 mM HEPES pH 7.5, 300 mM NaCl, 5%glycerol, 10 mM imidazole) supplemented with 1 tablet of protease inhibitor (PI), and homogenised. Cell debris was removed by centrifugation and clear cell lysates were mixed with 150 µl Anti-FLAG M2 Affinity gel (Sigma Aldrich), incubated for 1 hr at 4°C. The resin was then washed three times with the same buffer containing 250 mM NaCl, resuspended in 1 ml of buffer I (50 mM HEPES pH 7.5, 100 mM NaCl), and purified MukB, MukBH or MukBHN were added. After 45 min incubation (4°C) the resin was washed three times, re-suspended in 200 µl of protein loading buffer (NEB) and analysed on 4–20% gradient SDS PAGE. Our design of amino acid substitutions in the coiled-coil of MukB neck and MukF helix 9 was informed by the arrangement and interactions at the interface between Scc1 kleisin helices that interact with the coiled-coil of cohesin (Gligoris et al., 2014). Both SMC coiled-coil helices, one protruding from N-terminal and the other from the C-terminal subdomain interact with Scc1. We targeted the MukB C-terminal helix for mutagenesis because we could make better predictions for the orientation of this helix in the MukB neck. Three sets of double mutations were constructed; they mapped to the same side of the helix, but with each set on a slightly different face. The rationale for mutagenesis in MukF helix 9 was to mutate solvent exposed residues that were not predicted to interact with other MukF helices, or be obstructed by MukE binding. Three sets of triple mutations along the helix were constructed. All amino acid residues chosen for mutagenesis were either invariant or very highly conserved among bacterial species. Point mutations in plasmid-encoded genes were made using Q5 site-directed mutagenesis Kit (NEB). Primers were designed with NEBase Changer. 10 ng of the template was taken to the reaction. Plasmids were isolated and mutations confirmed by sequencing. The ability of leaky plasmid-encoded MukF or MukB expression from pET21, in the absence of IPTG, to complement the temperature-sensitive growth defect of ∆mukF (AB 233) or ∆mukB (RRL149) cells, respectively, at 37°C in LB was assayed. Cells were transformed with pET21 carrying MukF or MukB, or their variants, and allowed to recover for 8 hr post transformation at permissive temperature then plated in duplicates on LB plates containing carbenicillin (100 µg/ml). One plate was incubated at non-permissive (37°C) and the other one at permissive (20°C) temperature. Colonies from plates incubated at permissive temperature were streaked in duplicate and grown at permissive and non-permissive temperature along with positive and negative controls. Strains were streaked onto LB plates with appropriate antibiotics. Single colonies were inoculated into M9 glycerol (0.2%) and grown overnight at 37°C to A6000.4–0.6, then diluted into fresh M9 and grown to A600 0.1. Cells were spun and immobilised on agarose pads between two glass coverslips (1.5 thickness). 1% agarose pads were prepared by mixing low-fluorescence 2% agarose (Bio-Rad) in dH2O 1:1 with 2x growth medium. For analysis of MukBEF fluorescent clusters (foci), strains carrying either functional MukBmYPet (SN182), or the ATP hydrolysis-impaired mutant MukBEQmYPet (SN311, Nolivos et al., 2016) were used. Wide-field fluorescence microscopy used an Eclipse TE2000-U microscope (Nikon), equipped with an 100x/NA1.4 oil PlanApo objective and a Cool-Snap HQ2 CCD, and using Metamorph software for image acquisition. Over-expression of FN2 and FC2 was from pBAD24 plasmids containing the appropriate arabinose-inducible MukF derivative. Strains were transformed with given plasmid and grown in M9 glycerol medium supplemented with 0.2% glucose to limit leaky expression from the arabinose promoter. Once cultures reached A600 ~0.1, cells were centrifuged and re-suspended in M9 glycerol medium supplemented with 0.2% L-Arabinose and grown at 37°C. Every 20 min, cells from1 ml of culture were taken, centrifuged, placed on agarose pad and imaged. As a control, strain carrying empty pBAD24 vector was analysed. Cells were segmented from brightfield images using MicrobeTracker (Sliusarenko et al., 2011). MukB foci were detected using ‘spotfinderM’, available as part of the MicrobeTracker Suite. FCS was carried out on a ConfoCor 2 system (Carl Zeiss). The 633 nm line of a HeNe laser was directed via a 488/561/633 dichroic mirror and focused with a Zeiss C-Apochromat 40 Å~NA 1.2 water immersion objective to excite experimental samples containing Cy5. Fluorescence emission was collected using a 655 nm long pass filter and recorded by an avalanche photodiode. The pinhole diameter was adjusted to 83 μm (one Airy unit), and the pinhole position was optimised with use of the automatic pinhole adjustment for Cy5. All FCS experiments were carried out in Lab-Tek (Nagle Nunc International) eight-well chambered borosilicate glass plates at 22 ± 1°C. In the assay, diffusion of Cy5-labelled FN2 and FN10 fragments at fixed concentrations (~10 nM) was measured in samples carrying MukB at a range of concentrations up to 160 μM. Since MukB is much larger than any of the fragments used, up to a 3-fold increase in diffusion time was observed. where T is the average fraction of dye molecules in the triplet state with the relaxation time τT, N is the average number of fluorescent molecules in the volume observed, Y is the relative fraction of fragment bound to MukB, τ substrate and τ product are the diffusion time constants of free protein (labelled fragment as indicated for individual experiment and fragment bound to MukB), respectively, and r0 and z0 are the lateral and axial dimensions, respectively, of the observation volume. All calculations, including the evaluation of the autocorrelation curves, which was carried out with a Marquardt nonlinear least-square fitting procedure, were performed using the ConfoCor 2 instrument software. To obtain the % of bound and unbound fragments, the diffusion times for fluorescently labelled fragment were measured and fixed during data analysis. The diffusion time for the complex of a given fragment and MukB was estimated based on measured diffusion time for labelled MukB. No change in diffusion time for labelled MukB was observed when unlabelled fragment was added; therefore, the measured diffusion time for MukB was used as a fixed value during data analysis. MukB+ (SN182) and MukBEQ mutant (SN311) cells were transformed with pBAD, pBAD-FN2 (pKZ111) and pBAD-FC5 (pZ103) plasmids. Cells were grown at 22°C, to A6000.4–0.6, induced with 0.2% L-Arabinose for 3 hr. Cultures were spun down and cell pellets were resuspended in gel loading buffer and proteins were separated by a 4–20% gradient SDS PAGE followed by Western blots with mouse anti-MukF antibody as primary and goat anti-mouse as secondary antibody. In-solution trypsin digestion. Bacterial lysates were prepared from 50 ml cultures grown in M9 minimum media to A600 ~0.2, with expression from pBAD- induced with 0.2% arabinose for 1 hr. Cells were centrifuged and the pellet was resuspended in 200 μL of 0.1% SDS in PBS, sonicated and incubated for 5 min at 100°C. After centrifugation, supernatant was collected and protein concentration was as assessed using the BCA (Thermo Fisher Scientific, USA) method. Then, 10 μg of protein extract was digested with 0.2 μg of sequencing-grade trypsin (Promega, Mannheim, Germany) overnight at 37°C Proteins were reduced with DTT and alkylated using iodoacetamide. Each sample was prepared for digestion in duplicate. NanoLC-MS/MS Analysis. For each run, 1.5 μg of the digested protein samples was injected onto an RP C18 precolumn (Thermo Fisher Scientific, Waltham, MA, USA) connected to a 75 μm i.d. ×25 cm RP C18 Acclaim PepMap column with a particle size of 2 μm and a pore size of 100 Å, using a Dionex UltiMate 3000 RSLCnano System (Thermo Fisher Scientific). Every sample was injected in duplicate at random. Before analysis, the system was calibrated using Pierce LTQ ESI Positive Ion Calibration Solution (Thermo Fisher Scientific). The following LC buffers were used: buffer A (0.1% (v/v) formic acid in Milli-Q water) and buffer B (0.1% formic acid in 90% acetonitrile). The peptides were eluted from the column with a constant flow rate of 300 nL.min−1 with a linear gradient of buffer B from 5% to 65% for 120 min. At 100 min, the gradient was increased to 90% B and was held there for 10 min. Between 110 and 120 min, the gradient returned to 5% to re-equilibrate the column for the next injection. The peptides eluted from the column were analysed in the data-dependent MS/MS mode on a Q-Exactive Orbitrap mass spectrometer (Thermo Fisher Scientific). The instrument settings were as follows: the resolution was set to 70,000 for MS scans, and 17,500 for the MS/MS scans to increase the acquisition rate. The MS scan range was from 300 to 2000 m/z. The MS AGC target was set to 1 × 106 counts, whereas the MS/MS AGC target was set to 5 × 104. Dynamic exclusion was set with a duration of 20 s. The isolation window was set to 2 m/z. Analysis of proteomic data. After each LC-MS/MS run, the raw files were analysed by Proteome Discoverer, version 1.4.14 (Thermo Fisher Scientific). The identification of proteins was performed using the MASCOT engine against the UniProt after adding to database sequences of recombinant proteins FN2 and FC5. Analyses were completed using the following parameters: a tolerance level of 10 ppm for MS and 0.05 Da for MS/MS and with 1% FDR. Trypsin was used as the digesting enzyme, and one missed cleavage was allowed. Estimation of protein abundance was based on the emPAI parameter (Ishihama et al., 2005). Journal of Biological Chemistry 291:23999–24008. Nature Structural & Molecular Biology 20:371–379. Nature Structural & Molecular Biology 15:411–418. Nature Structural & Molecular Biology 18:894–901. Trends in Cell Biology 26:680–693. Journal of Molecular Biology 412:578–590. Journal of Biological Chemistry 288:7653–7661. Molecular & Cellular Proteomics 4:1265–1272. Journal of Biological Chemistry 292:16904–16920. Journal of Molecular Biology 391:57–73. Chromosome segregation: how to open cohesin without cutting the ring? Cohesin: a catenase with separate entry and exit gates? Journal of Biological Chemistry 281:4606–4615. Journal of Biological Chemistry 281:34208–34217. Nature Reviews Molecular Cell Biology 17:399–412. Journal of Molecular Biology 414:578–595. Molecular & General Genetics : MGG 250:241–245. Thank you for submitting your article "Asymmetric MukB ATPases are regulated independently by the N- and C-terminal domains of MukF kleisin" for consideration by eLife. Your article has been reviewed by three peer reviewers, and the evaluation has been overseen by a Reviewing Editor and Andrea Musacchio as the Senior Editor. The reviewers have opted to remain anonymous. The manuscript by Zawadzka et al. investigates the architecture of the E. coli MukBEF complex, its implications for the ATPase cycle and cellular functions. SMC complexes are genomic linkers that co-entrap DNA double helices using a large protein structure. Most SMC complexes form tripartite protein rings by the association of two SMC proteins with one kleisin subunit. In case of MukBEF, the exact architecture is less clear. MukF is an unusual member of the family of kleisin proteins. It forms homodimers via the interaction of its extreme N-terminal domain. In contrast, the kleisin subunits of other SMC complexes are known to interact with the head-proximal SMC coiled coil to form one of the three SMC ring interfaces. All three reviewers agree that the manuscript provides solid and important new insights into MukBEF biochemistry and that it should appeal to a wide readership. However, the reviewers also raised a number of points, many of which can be addressed through textual changes or changes to the figures, as detailed below. Reviewer 2 found the manuscript very hard to read, and recommends that you work on your figures to make them more comprehensible. The reviewer also would like to see shorter figure legends and a substantially shortened Discussion section. There is also a general feeling that a cartoon drawing of the 'rock climber' model based on the authors' new findings would be desirable. A strong objection, underlined by all three reviewers (and discussed again at points 7 and 8 of the "Required experimental additions" section), concerns the claim that MukB-F contains two independent ATPase domains. The reviewers believe that the data fail to demonstrate that the architecture of holo-MukBEF complexes is asymmetric. It is possible that a given MukF dimer binds symmetrically to either a single MukB dimer or to a dimer of MukB dimers. It is also unclear, whether FN or FC regulate the two MukB head domains differentially. The presented data is consistent with symmetric ATP hydrolysis by MukB. For instance, binding to FN or to FC might promote MukB head engagement rather than the ATP hydrolysis step. Thus, it seems premature to entertain different timing or different purpose for ATP hydrolysis by the one or the other MukB head domain. It is especially important that, among the other points, you adequately address this specific concern. 1) Figure 2B. In this semi-quantitative interaction assay it appears that interaction of the FN2, FN3 and FN4 deletion proteins with MukB is sequentially weakened, in this order. This suggests that the N-WHD and helixes 6 and 7 also make a contribution to MukB interaction. Is this the case? 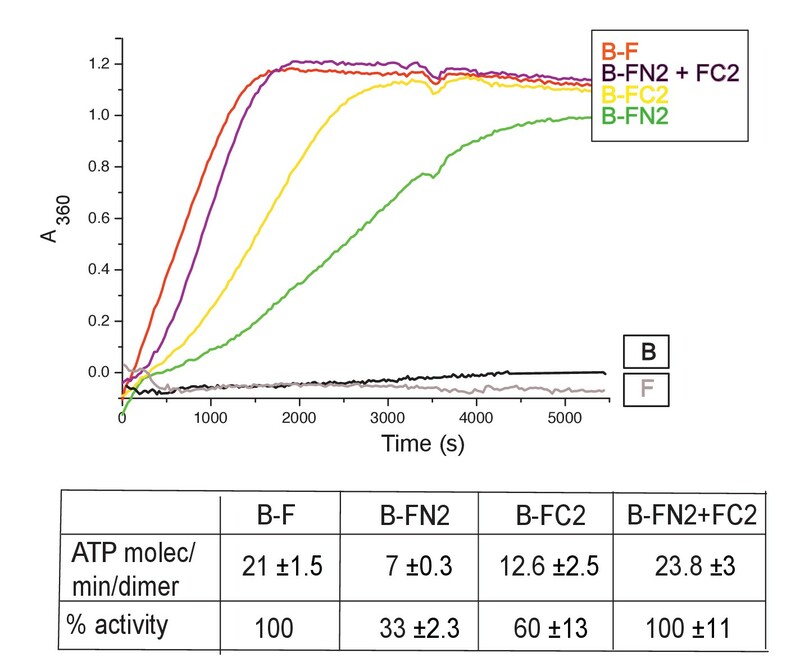 Clarification could come from the inclusion of FN4 in comparison with FN2 in the quantitative interaction assay (shown in Figure 3—figure supplement 3). Else, this should at least be discussed. 2) In addition, in this experiment, there also appears to be a detectable interaction between FN2 and the MukB head domain (MukB-H). Is this due to a contact between N-WHD and MukB-H? It would be useful to see a side-by-side comparison of FN2 interaction with MukB-H and MukB-HN to clarify this. 3) Figure 8/subsection “The MukF N-terminal and C-terminal domains independently modulate MukBEF action in vivo” "FN2 overexpression led to a ca. 4-fold more efficient displacement of labelled MukBEF complexes". This comparison is valid only if the overexpression levels and kinetics of FN2 and FC2 are comparable. This should be confirmed. 4) The ATPase assay in Figure 5B lacks data that is referred to in the text, that the Bm2 mutant confers wt ATPase activity. 5) Subsection “The MukF C- and N-terminal domains activate MukB ATPase independently and additively”: The mixture of N- and C-terminal domain of MukF recovered the MukB ATPase activity up to the level in the presence of full-length MukF, leading to a conclusion that the MukB ATPase is activated "additively and independently" by FN and FC. Here, FC is not the MukF C-terminal WHD only, but it additionally includes the preceding linker sequence and the segment binds two MukE molecules (collectively termed MukF middle region). Therefore, the term FC is confusing, and at the same time how MukE binding region could increase the MukB ATPase activity (Figure 7) is surprising. The author generated many MukF fragments. Perhaps, it may be necessary to measure the MukB ATPase activity with other FNs + FCs combinations. 6) Figure 7C: First, why was only MukBF normalized? Second, negative control, such as FN2 or FC5 (no MukF middle region) is recommended to be included. 7) If MukB heads display asymmetric ATPase activity as proposed in this manuscript, it should be possible to test this more directly and rigorously using the strong stimulation of MukB ATPase by MukF. For example, does FN stimulate ATP hydrolysis by "free" MukB-head, when bound to a ATP-hydrolysis defective MukB-head-neck construct? Or similarly, does FC bound to an ATP-hydrolysis defective MukB-head stimulate the ATPase activity of "free" MukB heads (which are unable to bind FC)? 8) Figure 4 is taken to suggest that the MukB-F "asymmetric complex contains two independent ATPase domains, one activated by the MukF N-terminal domain and the other activated by the C-terminal domain". The data clearly show that the MukB ATPase can be independently activated by the MukF N- and C-termini. However, it is not at all clear, nor likely, that therefore MukB contains two independent ATPases. In all cases where this was studied, ABC ATPases function as coordinate ATPases. The ATPase may well integrate various levels of independent input, but are still likely to use a concerted reaction to hydrolyse both ATPs. To support a claim that the two ATPases are independent, it is necessary to construct mixed MukB dimers with mutations in one of the two ATPase active sites. Only then can be tested whether the ATPases are indeed independent. Without such data, it is correct to say that both MukF N- and C- termini independently and additively activate the dimeric MukB ATPase. 9) Figure 8A: The observed dissolution of MukB foci by overexpression of FN might alternatively be explained by the disruption of MukF dimers by FN. If so, then the presented experiment fails to provide evidence for ring opening at the MukB-MukF-N interface. 10) Figure 7C: As control that MukE indeed acts via MukF, please include MukF fragments that stimulate MukB ATPase activity (for example FN2) but do not interact with MukE. The impression given in the text is that MukB-HN differs from MukB-H only in an additional 'neck' region. However, Figure 3 reveals that MukB-HN is over 30 kDa larger than MukB-H. This suggests that MukB-HN contains substantial additional parts of MukB. It is important to give a clear description, at the outset of the experiments, of what these two constructs include. Introduction, "hawk proteins" are more widely known as HEAT repeat subunits. While you should have the freedom to use one or the other name, we recommend that you spell out the HAWK acronym and that you refer to the presence of HEAT repeats in these proteins. Subsection “Characterization of the interactions between the MukB neck and MukF”, 'The mutagenesis strategy was informed by MukB and MukF sequence homology and structures […]', this strategy could be better described, e.g. it is not clear in Figure 5B what the Bm1-Bm3 mutations in 'green, blue and orange' are and how they probe interactions of the different faces of the helix. How do they relate to the structures of BsSMC and cohesin, shown in the inserts? Subsection “Characterization of the interactions between the MukB neck and MukF” discusses the implications of the MukF N-terminal interaction with the MukB neck. "if simultaneous binding of the two necks within the intact MukB dimer by the N-terminal domains of MukF dimer is possible […]". Reviewer 1 thinks that this is an interesting consideration, but that it would initially be more important to describe and discuss how the newly described asymmetric interaction of MukF N- and C-termini with the MukB neck and cup is compatible with the available structural data. Subsection “MukE inhibits MukBF ATPase” "in agreement with a report by Bahng et al. ": the authors should elect to cite other previous studies that have observed inhibition of the MukB ATPase in addition to MukEF. Subsection “DNA binding to MukB relieves MukE-mediated ATPase inhibition” "The position of the DNA binding interface on MukB heads", please describe where that is. Figure 8/Subsection “The functional interaction between the MukF N-terminal domain and the MukB neck breaks and reforms during cycles of ATP binding and Hydrolysis” "The analyses reported here demonstrate that the interaction between the MukF N-terminal domain and MukB neck is […] broken and reformed during cycles of ATP binding and hydrolysis." This is a tempting conclusion, but it is not strictly shown by the data. What is shown is that the EQ mutant is resistant to displacement by overexpressed MukF fragments. However, the EQ mutant also shows a very different localisation compared to wild type MukBEF, concentrated at the terminus rather than the origin. The reason for the different response to MukF fragment overexpression could therefore be indirect. It could be either due to the different location in the cell (and whatever the reason for this is), or could be due to the inability to hydrolyse ATP. This point has to be made clear to the readership. Hydrolysis” "This result provides further support for a mechanism in which ATP hydrolysis is required to release MukBEF complexes from chromosomes (Nolivos et al., 2016)". Direct biochemical evidence that ATP hydrolysis is required to release an SMC complex from DNA has been provided by Murayama et al., 2015, which is relevant to this context and should be cited accordingly. Subsection “Perspective” "turnover of cohesion complexes on chromosomes […] is inhibited by acetylation of the SMC subunit, which presumably inhibits SMC3 ATPase". Biochemical evidence that the acetylation acceptor lysines indeed convey DNA-stimulated ATP hydrolysis has also been provided by Murayama et al., 2015, which should therefore be cited. The Discussion entertains the "rock climber" model for the MukBEF complex, which predicts that MukBEF dimerization mediated by MukF is crucial for the function of the complex. While there is no evidence as yet that other SMC complexes use a similar strategy, it is worth to discuss this interesting proposal in more depth. It could be pointed out that disruption of the MukF dimerization interface, based on the available structural data, seems to be an achievable task that should be able to probe the importance of MukBEF dimerization. In the Abstract, "turns over" is ambiguous. Figure 1B: ATPγS is invisible. In Subsection “The MukF N-terminal domain interacts with the MukB neck” and after: Helix 9 is stated to be essential either because it interacts with the neck, or because it is required for proper folding of the helix 8-9. This ambiguous statement is not consistent with the mutagenesis study: targeted mutations on Helix 9 disrupted the interaction of MukF and MukB neck. Figure 2A: There are no FN5 and FN8, and the numbering does not seem to be used with consistence. The naming could be improved. Figure 2B: The label 'resin' is not readily comprehended. 'IgG from resin' would be better. Subsection “The MukF N-terminal domain interacts with the MukB neck”: "size exclusion chromatography-multi-angle light scattering (SEC-MALS)" has to be in the first paragraph rather than the second paragraph. Subsection “The MukF N-terminal domain interacts with the MukB neck”, Need to explicitly define FN2 dimer as 2FN. Subsection “The MukF N-terminal domain interacts with the MukB neck” and on others: The expression like "MukBHN+2FN2 at 1:1.25 monomer:dimer (1:2.5 m:m) molar ratio" is superfluous. "MukBHN+2FN2 at 1:1.25 molar ratio" is succinct and sufficient. Subsection “The MukF N-terminal domain interacts with the MukB neck”: The statement of "This is consistent with MukBHN, which is a monomer in solution, being unable to form stable heads engaged dimers with either FN2 or FC2 in the presence of ATP." appears in contradiction with the crystal structure of ATP-bound engaged MukB head dimers. Please explain. Subsection “Characterization of the interactions between the MukB neck and MukF”: The authors should show how the residues on Helix 9 were chosen for mutagenesis: the sequence alignment of kleisins and structural analysis of the Kleisin-Smc neck interactions. Figure 5: The colors of the structural elements do not match with the Figure legends. Need to label figures (e.g., Helix 8, Helix 9, N-WHD, ScpA, Scc1, MukB, Smc, Smc3). Need to label mutations. In fact, it would be much better to show the entire crystal structure of MukF-MukB, and enlarge the region of mutated positions. The insets at the bottom of Figure 5B do not help understanding how the mutated residues were selected. As mentioned above, sequence alignment and structural analysis should be shown to clarify this important point. Mutated residues in stick representation should be consistent with Figure 5A. Subsection “MukE inhibits MukBF ATPase”: The sentence, "which cited our previously unpublished observation" is unnecessary. Subsection “MukE inhibits MukBF ATPase” and Figure 6A: Rather than this figure, it is Figure 6—figure supplement 1 that supports the concentration-dependent inhibition of MukF-activated MukB ATPase. In Figure 6B, B-F-E 5xDNA is not shown in the table. Subsection “DNA binding to MukB relieves MukE-mediated ATPase inhibition”: Data have to be shown. modulate MukBEF action in vivo” and Figure 8: 'FN2' and 'FC2' are stated in the text, but figure shows 'FN2' and 'FC5'. Subsection “Perspective”: typo, 'held' should be 'hold'. 'cohesion' should be 'cohesin'. Subsection “Perspective”: "[…], and associated conformational change" would be correct. Subsection “Perspective”: The last sentence has no verb, and has to be corrected. Figure 3—figure supplement 2: The legend reads "SEC-MALS analysis of MukBHN-2FN2 and MukBHN-FN2-FC2 complexes in the absence and presence of ATP (1 mM)." but there are no labels on the figure to distinguish which is which. Moreover, this figure appears to be exactly the same as Figure 3—figure supplement 1. Figure 4—figure supplement 1: There is no graph for (E)! Figure 5—figure supplement 1: It is surprising to see that only three point mutations induced big changes in the elution volume. Why is this the case? Also, there is no chromatogram for HN+2FN2m1. Figure 5—figure supplement 4: Panel B is very difficult to grasp and should be improved to make it clearer. At the same time, the authors need to show the model of the full-length MukF dimer interacting with two MukB molecules so that readers could grasp how the MukBEF holocomplex looks like given the newly identified interaction. Figure 5B: Why does MukF not stimulate MukBm1 ATPase activity? It would be expected to bind to MukBm1 via the intact interface and stimulate its activity (as FC does). The SEC-MALS experiments are very clear. However, a scale for A280 absorption on the y-axis would be helpful. The choice of residues to be mutated in FN and MukB-neck is poorly described (subsection “Characterization of the interactions between the MukB neck and MukF”). Please include sequence alignments and structural comparisons. Figure 2B: The color-coding is helpful. In addition, the names of the construct should be shown as well. Subsection “The functional interaction between the MukF N-terminal domain and the MukB neck breaks and reforms during cycles of ATP binding and Hydrolysis”: The manuscript does not directly address (let alone demonstrate) that the interaction is broken and reformed. As written, the claim is too strong and should be softened. Subsection “MukE and DNA compete during cycles of ATP binding and hydrolysis”. "target to ori" may be better than "relocate to ori". Based on known structural information: how does a MukF dimer bring together two MukB dimers? Would it be possible to include a tentative model? […] All three reviewers agree that the manuscript provides solid and important new insights into MukBEF biochemistry and that it should appeal to a wide readership. However, the reviewers also raised a number of points, many of which can be addressed through textual changes or changes to the figures, as detailed below. Reviewer 2 found the manuscript very hard to read, and recommends that you work on your figures to make them more comprehensible. The reviewer also would like to see shorter figure legends and a substantially shortened Discussion section. There is also a general feeling that a cartoon drawing of the 'rock climber' model based on the authors' new findings would be desirable. We have revised the figures substantially to address this point and to make them more accessible to the general reader. We have made figure legends more concise; they now more accurately describe the figures. Furthermore, as requested, we have added an additional figure (Figure 9), which summarizes the findings presented in the paper and shows how these relate to the rock/rope climbing model proposed in outline earlier [which is revised appropriately, taking into account the results here]. We have re-written the Discussion section to make it more concise and incisive. A strong objection, underlined by all three reviewers (and discussed again at points 7 and 8 of the "Required experimental additions" section), concerns the claim that MukB-F contains two independent ATPase domains. The reviewers believe that the data fail to demonstrate that the architecture of holo-MukBEF complexes is asymmetric. It is possible that a given MukF dimer binds symmetrically to either a single MukB dimer or to a dimer of MukB dimers. It is also unclear, whether FN or FC regulate the two MukB head domains differentially. The presented data are consistent with symmetric ATP hydrolysis by MukB. For instance, binding to FN or to FC might promote MukB head engagement rather than the ATP hydrolysis step. Thus, it seems premature to entertain different timing or different purpose for ATP hydrolysis by the one or the other MukB head domain. It is especially important that, among the other points, you adequately address this specific concern. We have taken these important concerns into account in our revised manuscript. Regarding the reviewers’ objection to our suggestion that the independent activation of MukB ATPase hydrolysis by the N- and C-terminal subdomains of MukF may reflect a presence of two independently-controlled ATPases, which become active at different stages of MukBEF-DNA activity cycle, we agree that this was a speculative suggestion. We therefore, have removed any references to this from the Title, Abstract and the Results section, and we have limited any discussion of this to the Discussion section, where it is raised as one possible hypothesis that could explain our data. We discuss this critically in relation to past and emerging new literature (in particular to a new BioRxiv paper from the Rowland-Haering labs; Elbatsh et al., 2017). With regard to MukB dimers forming an asymmetric complex on ATP (or equivalent) binding in the presence of MukEF, we more explicitly point out that the crystal structure of a MukBEF heads-engaged complex determined by Byung-Ha Oh and colleagues (Woo et al., 2009) demonstrated an asymmetric complex that provides a platform for the interpretation of our data. This structure provided a partial molecular explanation of the asymmetry, because in the heads-engaged state, binding of a second MukF C-terminal domain was sterically prevented by the binding of the MukF middle region attached to the C-terminal domain bound to a head. Furthermore, this paper showed that this displacement of a second MukF C-terminal domain during MukB head engagement occurs in solution and the MukF middle region is required for this displacement. Nevertheless, this work could not address any interaction of the MukF N-terminal domain with the MukB neck, because this domain was absent in the proteins used for crystallography. 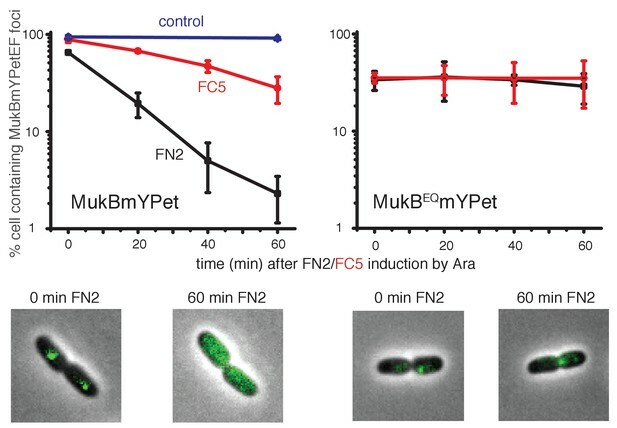 Our demonstration of such an interaction demonstrates MukBEF likely has an asymmetric architecture comparable to other SMC complexes (notably B. subtilis SMC and eukaryote cohesin complexes). We agree that our work does not provide direct evidence for the N-and C-terminal domains of MukF binding to different monomers of MukB dimer and this is clearly pointed out with appropriate schematics in the revised manuscript (Figure 9 and accompanying text). Nevertheless, unless the Woo et al. asymmetric structure is functionally irrelevant, then our demonstration of the MukF-MukB neck interaction, substantiates and strengthens the case for asymmetry in the heads-engaged dimeric complex, although the dimer of dimers complex would be symmetric. In our opinion, all of this is addressed satisfactorily in the revised manuscript. Parenthetically, if both N- and C-terminal domains within a MukF monomer bind ‘in cis’ to the same MukB monomer, asymmetry would still be present (Figure 9), although there would be less justification for proposing that they activate two different ATPases. The reviewer is correct in pointing out that superficial examination of the semi-quantitative pulldowns, indicates that interaction of N-terminal MukF truncations with MukB or MukBHN may weaken as the variants get smaller (Figure 2B top left and right panels). Nevertheless, closer examination shows that the levels of the respective MukF variants on the FLAG resin also decreases in the same order, consistent with the possibility that the level of pulldown signal is influenced by the amount of ‘bait’ on the resin. Therefore, we see no strong grounds to implicate either the N-WHD or helices 6 and 7 in the interaction. Close examination of the figure makes this point obvious; we now point this out in the revised legend. Importantly, these assays demonstrate that a MukF truncation bearing helices 8 and 9 is sufficient for interaction with the MukB neck in extracts. The variant FN4, containing helices 8 and 9, was not biochemically tractable during and after purification, so we have been unable to study its interaction with the MukB neck by SEC-MALS etc. We now state this in the revised manuscript (Figure 2). Very small amounts of MukBH (slightly above the background level) were reproducibly recovered in samples with FN2 in the pulldowns (note, substantially less pulldown than in combinations in which the interaction was further validated, including interaction of FN2 with MukBHN, as the reviewer requested (Figure 2B; top right panel). Nevertheless, we were unable to validate such an interaction by SECMALS, suggesting that either it is not real, or it is insufficiently strong to survive gel filtration. We have now included a sentence about this possible weak contribution to binding in the text (subsection “The MukF N-terminal domain interacts with the MukB neck”). We now include proteins levels (Westerns and quantitative proteomics before and after over-expression in wild type and MukBEQ cells; Figure 8—figure supplement 2). Westerns indicate similar levels of FN2 and FC2 over-expression in MukB+ and MukBEQ strains, with >100 excess of these peptides over endogenous MukF levels. The data showing wild type ATPase activity for mutant Bm2 have been added to Figure 5B. Regarding nomenclature, in our opinion, the convention we use is robust, straightforward and explicit. Variants that include the N-terminus of MukF are designated FN, while variants that contain the C-terminus are called FC (the extent of the additional sequences are evident in Figure 2). The only exception to this convention are internal fragments carrying four-helix bundle, which were designated ‘FN’, because they contain the MukF N-terminal domain. We prefer to retain this convention, because other schemes that we could think of were less clear. The data presented in Figure 7B showing the effect of the middle region on stimulation of MukB ATPase are now discussed more extensively. We are not particularly surprised that increasing the length of the variant led to modest increases in ATPase; this could simply be a consequence increased length enhancing folding or stabilizing the polypeptide. It is not obvious to us how further experiments with other FN + FC combinations would be additionally informative. What is ultimately required is structural information on the interaction! 6) Figure 7C: First, why was only MukBF normalized? Following the reviewer’s comment, we have altered Figure 7B; now the bar graph shows all data expressed as absolute ATPase values. Second, negative control, such as FN2 or FC5 (no MukF middle region) is recommended to be included. See response to 8 below. 8) Figure 4 is taken to suggest that the MukB-F "asymmetric complex contains two independent ATPase domains, one activated by the MukF N-terminal domain and the other activated by the C-terminal domain". The data clearly show that the MukB ATPase can be independently activated by the MukF N- and C-termini. However, it is not at all clear, nor likely, that therefore MukB contains two independent ATPases. In all cases where this was studied, ABC ATPases function as coordinate ATPases. The ATPase may well integrate various levels of independent input, but are still likely to use a concerted reaction to hydrolyse both ATPs. To support a claim that the two ATPases are independent, it is necessary to construct mixed MukB dimers with mutations in one of the two ATPase active sites. Only then can be tested whether the ATPases are indeed independent. Without such data it is correct to say that both MukF N- and C- termini independently and additively activate the dimeric MukB ATPase. The suggestion of mixed dimers is a good idea, and we have pursued this experimentally for some time. Unfortunately, “free” MukB heads or MukBHNs do not dimerize significantly in the presence of ATP/AMPPNP under any experimental conditions we have tried and did not support significant ATPase levels in the presence or absence of MukF. Therefore, the experiments proposed in 7 above were not informative. Similarly, constructs carrying covalently joined dimeric MukBHNs showed very little MukF-dependent ATPase and are potentially compromised in mutant experiments because a given MukB N-terminal domain can potentially form a ‘head’ with either of the two C-terminal MukB domains in the covalent dimer. Experiments to address this issue are important, but challenging, and in our opinion beyond the scope of this manuscript. Parenthetically and worryingly, we understand from colleagues working with other SMC complexes, that the dimerization hinge may be important for ATPase activity, therefore making the sorts of experiments proposed here even more challenging. In our opinion, the revised manuscript deals with all of these concerns satisfactorily. If this was the case, the foci would also disappear in a MukBEQ mutant strain, unless disruption of dimers was also dependent on cycles of ATP binding and hydrolysis. This is all now discussed in the revised manuscript (subsection “The MukF N-terminal and C-terminal domains independently modulate MukBEF action in vivo”). Added and addressed above, see point 5. This has been addressed and corrected at the appropriate positions in the main text and legends. This has been expanded as requested (Introduction). Subsection “Characterization of the interactions between the MukB neck and MukF”, 'The mutagenesis strategy was informed by MukB and MukF sequence homology and structures[…]', this strategy could be better described, e.g. it is not clear in Figure 5B what the Bm1-Bm3 mutations in 'green, blue and orange' are and how they probe interactions of the different faces of the helix. How do they relate to the structures of BsSMC and cohesin, shown in the inserts? To address this comment, we have introduced a new section in Materials and methods section explaining the rationale behind our targeted mutagenesis strategy. We have changed the image of the modelled neck helix to show clearly the mutated residues in figure 5B; and included panel (C) to figure 5 showing more explicitly the overall similarity of interaction between the kleisins’ helices and the necks in SMCs. Thank you; this is now discussed in relation to Figure 9 (Discussion section). We are not clear what the reviewer is alluding to with regard to inhibition of MukB ATPase. MukB ATPase in the absence of MukEF is negligible. Our searches of PubMed and Google have not revealed previous relevant studies regarding inhibition of MukB(F) ATPase. Nor does the report of Bahng et al. help in providing insight into any other published relevant work. A Pymol cartoon showing the positions of amino acid residues, whose mutation affected DNA binding in Woo et al., (2009) report has been included in Figure 6C. Figure 8/ Subsection “The functional interaction between the MukF N-terminal domain and the MukB neck breaks and reforms during cycles of ATP binding and Hydrolysis” "The analyses reported here demonstrate that the interaction between the MukF N-terminal domain and MukB neck is […] broken and reformed during cycles of ATP binding and hydrolysis." This is a tempting conclusion, but it is not strictly shown by the data. What is shown is that the EQ mutant is resistant to displacement by overexpressed MukF fragments. However, the EQ mutant also shows a very different localisation compared to wild type MukBEF, concentrated at the terminus rather than the origin. The reason for the different response to MukF fragment overexpression could therefore be indirect. It could be either due to the different location in the cell (and whatever the reason for this is), or could be due to the inability to hydrolyze ATP. This point has to be made clear to the readership. We agree with the reviewer and this has been addressed in the revised manuscript, by stating an alternative explanation in the revised Results section and by making a ‘softened’ interpretation in the Discussion section. We agree that this is an excellent idea; experiments testing the functional consequences of disruption of MukF dimerization interface are underway and will be ready for publication soon; this work is not within the scope of the paper here. We agree that the original statement was ambiguous and misleading. We have changed the text on in subsection “The MukF N-terminal domain interacts with the MukB neck” (first paragraph) and then when we discuss the point mutants, we state that the requirement for helix 9 is unlikely to be because it is essential for correct folding. Variants were numbered in chronological order as they were constructed. FN5 and FN8, made at the same time as the other variants, are not a subject of the investigation here. Re-numbering all variants to achieve numerical chronology in this manuscript would not facilitate comprehension, but rather would confuse forever the group laboratory note books. We prefer to retain the nomenclature of the original manuscript. In our opinion, there is no contradiction. The crystal structure was made in the presence of MukE. In addition, high concentration of proteins in samples prepared for crystal structure experiments and crystal packing will have stabilized the ‘heads engaged’ complex. The sequence conservation between MukBEF and other kleisins-SMCs is poor. The rationale for targeted mutagenesis of helix9-neck interface is now provided as a separate section in Material and Methods. We have now extended analysis of the impact of mutations in helix 9 by assaying the ability of MukF variants carrying these mutations to suppress the effects of MukF deletion gene in in vivo complementation assays (Figure 5—figure supplement 2). We have revised Figure 5 to make all of the above clear. The published crystal structure of MukBEF (Woo et al., 2009) does not include the region of the neck, or the MukF N-terminal domain. Subsection “MukE inhibits MukBF ATPase” and Figure 6A: Rather than this figure, it is Figure 6—figure supplement 1 that supports the concentration-dependent inhibition of MukF-activated MukB ATPase. In Figure 6B, B-F-E 5xDNA is not shown in the table. Subsection “DNA binding to MukB relieves MukE-mediated ATPase inhibition”: Data has to be shown. Data is now shown in the revised manuscript; subsection “DNA binding to MukB relieves MukE-mediated ATPase inhibition”. The reviewer is correct, FC5 has been used in the experiment and this is now corrected in the text. Yes, thank you, we changed the first typo; ‘cohesion’ is correct. Yes, thank you. We have made the correction. OOOPs! The revised manuscript corrects this. In the initial submission, Figure 3—figure supplement 1 was placed twice, firstly labelled correctly and second as Figure 3—figure supplement 2. The correct Figure 3—figure supplement 2 is present and all labels are now correct. Sorry-there should have been no reference to panel (E) in the legend and that part of the legend has been deleted. There is no reference to this in the text. We understand also that the reviewer wishes to see the titrations in the presence of MukE; these are now present in Figure 6—figure supplement 1. The initial figure may have confused the reviewer-sorry! We do not know why the same proteins (whether it be 2FN2 or MukBHN) do not elute at quite the same elution volume in different runs. Furthermore, our initial figure labelling was not clear and may have confused the reviewer. This has been attended to in the revised manuscript. What is clear from the profiles is that 2FN2-MukBHN complexes form when wild type 2FN2 is present, but not when the 2FN2 mutants are used. In our opinion, there is no ambiguity to this conclusion in the revised figure. The model is now presented in Figure 9. Additionally, Figure 5 is improved. We do not know why this mutant in the MukB neck does not have its ATPase activated by interaction of the MukF C-terminal domain. We do have evidence that this protein is biochemically active as it binds to MukFE, but further work, outside of the scope of this manuscript, would be needed to investigate the reasons for failed activation by FC2. Because of this somewhat puzzling result, we have now analysed MukBm3 further. This variant had ~35% of ATPase activity in the presence of MukF (Figure 5). Importantly, we now show that FC2 activated MukBm3 ATPase as efficiently as MukF, while, FN2 failed to show any activation (Figure 5—figure supplement 3). We now include these new data and an appropriate comment on the puzzling properties of MukBm1. The scale is now included in all of the SEC-MALS experiments shown. now provided explicitly as a separate section in Material and Methods. The revised manuscript addresses this point both in the Results and Discussion sections. We have changed the text to “target to ori” as proposed. Schematics and a model are now included in Figure 9; the model extends a schematic initially published in Badrinarayanan et al., 2012. The work was supported by a Wellcome Trust Senior Investigator Award to DJS (099204/Z/12Z) and by the Leverhulme Trust (RP2013-K-017). PZ was also supported by a National Science Centre, Poland grant: 2015/19/P/NZ1/03859 and by a Foundation for Polish Science grant: First TEAM/2016-1/9. We thank all past and present DJS laboratory members for illuminating discussions. © 2018, Zawadzka et al.